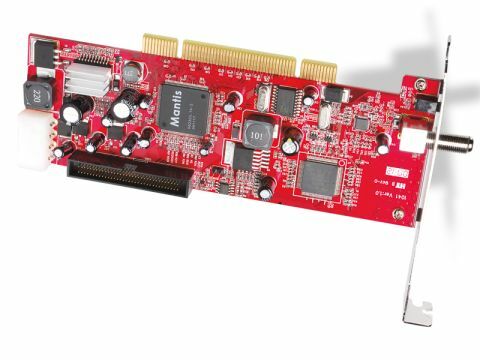 The Azurewave AD-SP400 is a rarity – an internally fitting DVB-S2- compatible PC satellite receiver supplied with a CI module which links to the main tuner card via a ribbon cable. This arrangement – which means you'll need two vacant PCI slots – will allow you to tune into the burgeoning choice of HD pay-TV broadcasts from Europe if you have the necessary CAM and viewing card. The AD-SP400 is also compatible with standard DVB-S services. Something else that makes the AD-SP400 unusual is its support for DiSEqC 1.2 and USALS motorised dishes (as opposed to simple DiSEqC 1.0 switchboxes). To this end, the AD-SP400 must be connected to one of the spare drive power connectors of your PC's power supply. The AD-SP400 gives you the ability to timeshift or record channels to your PC's hard disc with the accompanying software – the use of BDA drivers means that other software can be used as an alternative. The card also supports DVB-S datacasting, and will thus be of interest to those who rely on satellite for broadband internet delivery. An attachable IR sensor accepts commands from the included handset. A driver 'patch' allows Windows Multimedia Edition software, in its XP or Vista guises, to support DVB-S – something that's not normally possible. It does this by fooling MCE into believing that the AD-SP400 is a (supported) DVB-T card. The accompanying DigitalTV application could be more user-friendly but is well-featured. On offer are support for radio and TV, teletext, AC3 pass-through and timeshifting. There's also a friendly and fast 7-day EPG, from which timer recordings can be scheduled. Recording 'raw' transport streams is not allowed. Digital TV is perhaps a little 'soft' in terms of fine detail (compared with DVBViewer) although it fares well in terms of dynamic range and colour fidelity. Sound quality and sensitivity are both fair, although channel searches can be slow.